During summer times its quite beneficial to use lots of vazhaithandu/plantain stem in our diet as it has great diuretic properties.For a rasam/soup in SouthIndia generally use of tamarind juice(puli thani) is a must but some small number of varieties are made without tamarind too,with a definite tasty assurance.When we buy plantain stem it should be a fresh and tender and when slicing the stem itself we should remove the fibre and then cut it into desirable pieces.while buying banana stem I don’t care much because my vegetable vendor akka gives the best thandu/stem she herself will reject if the vegetable(stem) is not fresh.If you are going to prepare it little later its always better to put it in buttermilk mixed water so that it does not change its colour.While making this rasam some chopped pieces should be reserved before grinding to add finally to garnish the rasam.Its a public thing that every part of a plantain tree is very useful not only in cooking but it has great medicinal property with unlimited nutritional benefits.Plantain stem/vazhaithandu is well-known for its health benefits it removes the toxins from our body and prevents kidney stones.Usually we make,kootu,poriyal,pachidi from vazhaithandu and its a rare kind that we make rasam out of it,so surely try this variety for its healthy and tasty note!great with hot rice and some pappads or pickle. 1.First chop the plantain(take fibre out and chop) grind, take Juice out of it by adding water(1 glass of water). 2.Then make puree of tomatoes and cook dhal in pressure cooker smoothly and keep ready. 3.Add turmeric powder and rasam powder to the juice then add the tomato puree to it. 4.Now add dhal to it and mix well,add needed water to bring it to rasam consistency . 5.Keep a kadai add oil add mustard when it crackles add hing and curry leaves and then pour rasam mixture,salt,add coriander leaves with pieces of stem . 6.Leave it to form foam over corners add lemon juice and switch off. First chop the plantain(take fibre out and chop) grind, take Juice out of it by adding water(1 glass of water). Then make puree of tomatoes and cook dhal in pressure cooker smoothly and keep ready. Add turmeric powder and rasam powder to the juice then add the tomato puree to it. Now add dhal to it and mix well,add needed water to bring it to rasam consistency . Keep a kadai add oil add mustard when it crackles add hing and curry leaves and then pour rasam mixture,add coriander leaves with pieces of stem. Add salt and leave it to form foam over corners add lemon juice and switch off. There is no measured amount for water that can be listed you have to add needed water to bring it to rasam consistency. As lemon juice is added i have added less tangy tomatoes. 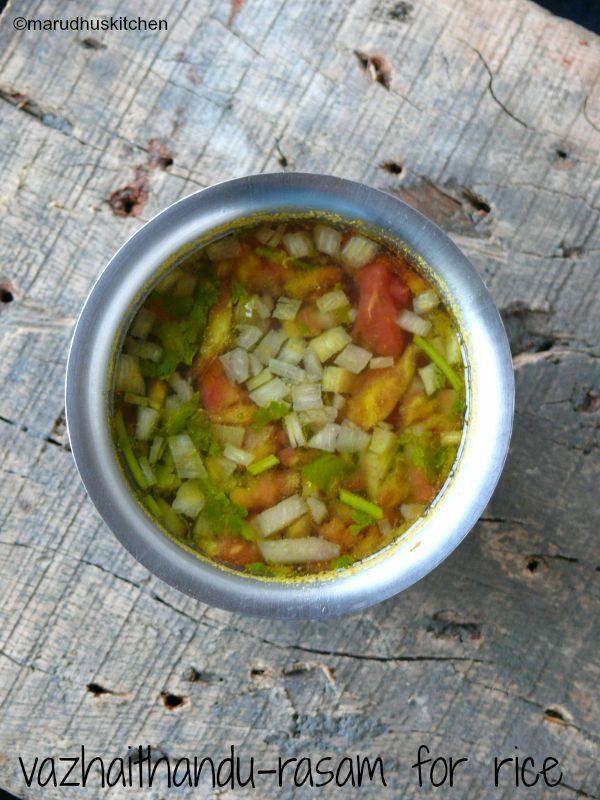 Adding ghee at last enhances the flavour of rasam. For plantain the fibre should be removed before chopping otherwise while grinding it will clog together. Don't leave the rasam to boil switch off when foam forms. lovely recipe…completely newrecipe….Simple and beautifully explained recipe…Thank you for sharing.. Visiting your Blog is always a pleasure because of the treasure trove of heirloom recipes and also the nutritive evaluation that you so beautifully present. I have eaten banana stem but never cooked with banana stem. 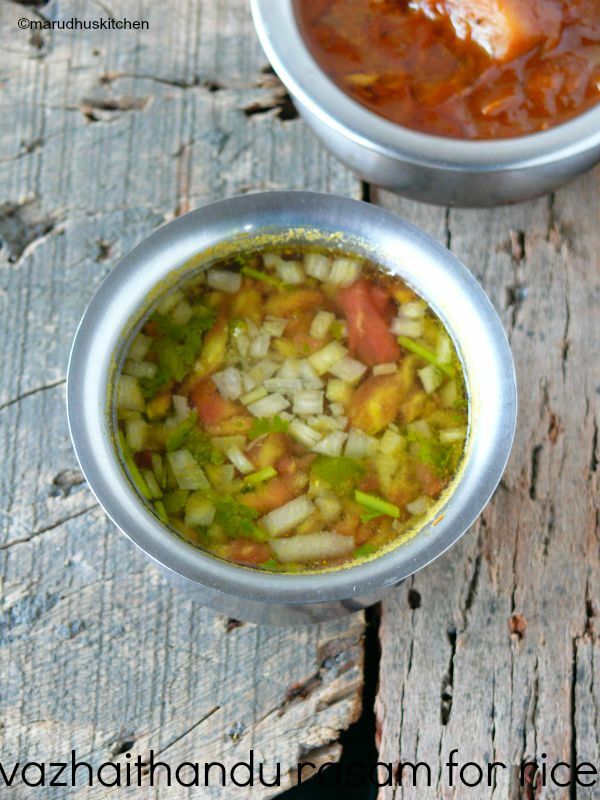 I want to try this awesome Rasam after going through your beautifully written post. And yes I will remember to soak the banana stem pieces in butter milk if I will not use them instantly. Loved the post sweetie. Comforting rasam!! perfect after all that festival hungama!! Wow! What an awesome rasam recipe. Banana stem sounds incredible. This is new to me. It just looks awesome dear.. Love this!